When families are equipped with the tools they need to be healthy, they will naturally become epicenters of love, blessing and leadership within their communities. I have met with and counseled pastors all over the world who are all facing the same problems within their church - the breakdown of the family - coming from the wound of fatherlessness. We have developed a conference weekend that will speak directly to this need and bring the healing your families are wanting. Choose from Men's, Women's or All Church Family Conferences. Women’s Conference: Pastor Ed has also been doing Women's Conferences for the past 20 years. He has discovered that, "women carry the same kind of wound from their fathers as men do. When a girl's relationship with the first man in her story - her father - causes pain or heartbreak, it can cause her to suffer the rest of her life in relationship issues with other men, their husbands and their children." God's blessing at these conferences has produced remarkable healing in the relationships in their life. 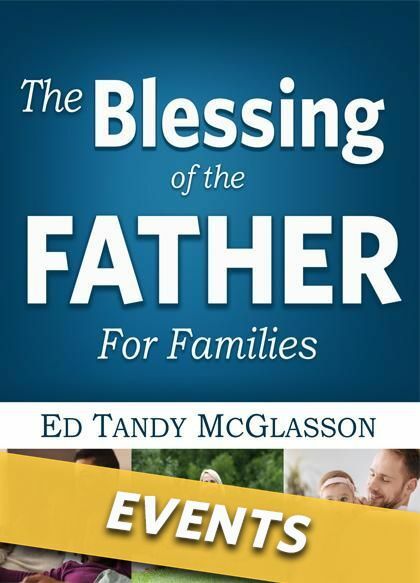 2 Hour Live Video Conference call with Pastor Ed Tandy McGlasson *to be scheduled according to Pastor Ed's calendar availability. Please contact us directly to hear more. Opportunity to purchase Workbooks at a bulk rate through our Small Groups Package and resale Workbooks to your church at retail value, to offset the cost of the event. Collateral Materials to help advertise and support your event including, "How to Host a Successful Small Group" (PDF download) and Customizeable Invitation Flier for your Small Groups (PDF download). COST: Contact Team for Price. ONLY 12 OPENINGS LEFT FOR 2019!! *We understand that not every group will be able to afford to have Pastor Ed come out to lead their conference. The heart of our ministry exists to bring this message to as many people on this planet as possible. For this reason, we created the “All Church Family Healing Program” as an alternative to having Pastor Ed out for the weekend. Our desire is that no one would be hindered from bringing this message to their community. Please follow the link to hear more about our Cost Mitigation Program with ideas we hope will help you bring this message of healing and hope to your community. We routinely sell bulk purchases of our book at a discounted rate through our Small Group Program (Link). We allow churches working with our program to purchase our Small Group program at the discounted rate and resell to their community for the retail price of the workbook. For example, if you purchased 250 books for your church through our Small Group Program, each book would be discounted 40%. Your cost per book would be $8.99 per book. If you choose to resale the book to your church community, you would be making up to $6 a book depending whether you choose to sell at resale price or slightly under the retail price. For a group of 250 people, this could offset your cost by $1500 as an example. Currently, we offer a set number of books in our Small Group Program. If you would like to order more books, please contact us directly at fathers@mac.com.